Growing demand for energy and the need to reduce our society's carbon footprint call for transformative measures to increase efficiency in energy consumption and sustainable methods of energy production and storage. Novel materials will be key to these transformative technologies by acting as catalysts and facilitating desired chemical transformations. Symposium U of the 2012 MRS Spring Meeting, 'Materials for Catalysis in Energy', was held April 10–13. The objective of the organisers was to bring together researchers from materials science, chemical synthesis, heterogeneous catalysis, electrocatalysis and photocatalysis to highlight recent progress and discuss challenges and opportunities in the materials aspect of catalysis research and development for energy applications. 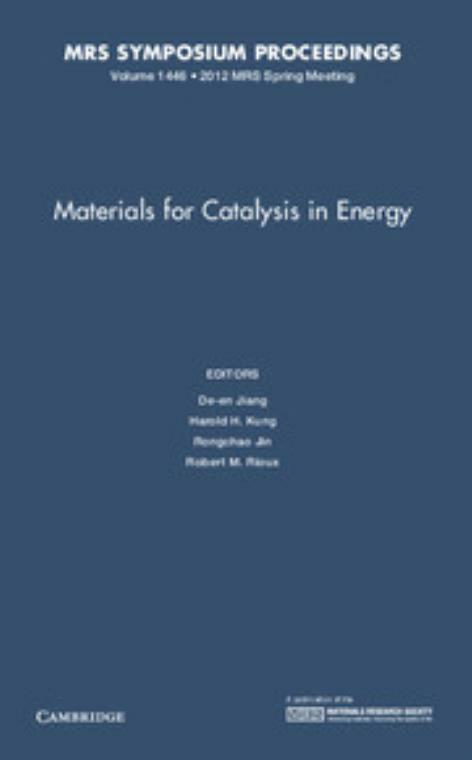 Close to 200 abstracts were received and about 150 papers were presented, demonstrating the significant interest from the broader catalysis community. This volume contains a cross-section of papers presented and highlights the interdisciplinary nature of this research area. 15. Shape-controlled synthesis of silver and palladium nanocrystals using β-cyclodextrin Gilles Berhault, Hafedh Kochkar and Abdelhamid Ghorbel. Harold H. Kung Northwestern University, Illinois. Rongchao Jin Carnegie Mellon University, Pennsylvania. Robert M. Rioux Pennsylvania State University.